ENTRY TO ALL EVENTS IS FREE! This year's Festival will run from 1 - 18 September at the Portobello Pop Up Cinema and Westbourne Studios. 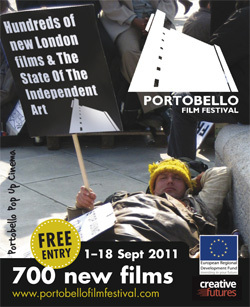 2011 features include a week of work by new London film makers, evenings dedicated to the latest Italian, Irish, Spanish and Caribbean films, and talks/Q&As with top directors. The sting with the most hits will get a prize at the Award Ceremony on 18 September. Portobello Film Festival is running a special programme for London Film Makers and new Production Companies. If you are interested in free delegate accreditation please email pff@btopenworld.com headed London Film Makers Convention.